Cam came over shortly after noon and we got started on working the track further up the helix. I had prepped the last few pieces of the benchwork earlier but Cam did the final adjustments before securing the track down. After a bit of lunch, Dan joined us and we started working on the benchwork out of the helix towards Arrowsmith. 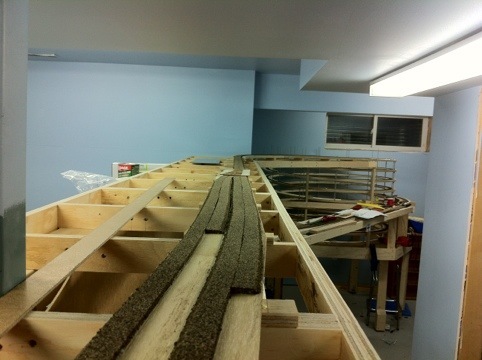 After prepping a little more cork than necessary, we pressed on with the benchwork fully into Arrowsmith siding (admittedly, it was more of a storage track than an actual siding in 1988.) to be able to use up the cork. 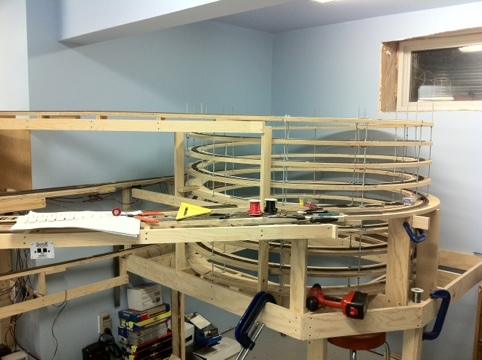 I also cut off the top of a few ready rods close to where the track exits out of the helix. A great day of progress! This entry was posted on February 12, 2012. It was filed under Benchwork, Trackwork, Wiring.